This article is about the 2018 biopic about Neil Armstrong. For the 2011 film, see The First Man (film). First Man is a 2018 American biographical drama film directed by Damien Chazelle and written by Josh Singer. Based on the book First Man: The Life of Neil A. Armstrong by James R. Hansen, the film stars Ryan Gosling as Neil Armstrong, alongside Claire Foy, Jason Clarke, Kyle Chandler, Corey Stoll, Ciarán Hinds, Christopher Abbott, Patrick Fugit, and Lukas Haas, and follows the years leading up to the Apollo 11 mission to the Moon in 1969. Steven Spielberg serves as an executive producer. The project was originally announced in 2003, with Clint Eastwood slated to direct. After that rendition fell though, Chazelle, Gosling and Singer all signed on by 2015, and principal photography began in Atlanta, Georgia in November 2017. In 1961, NASA test pilot Neil Armstrong is flying the X-15 rocket-powered spaceplane when it inadvertently bounces off the atmosphere. Although he manages to land the plane in the Mojave Desert, his colleagues express concern that his recent record of mishaps is due to distraction, and he is grounded. His two-and-a-half year old daughter, Karen, is undergoing treatment for a brain tumor. Desperate to save her, Armstrong keeps a detailed log of her symptoms and feverishly tries to find possible treatments, but she dies soon afterwards. Grief-stricken, Armstrong applies for Project Gemini and is accepted to NASA Astronaut Group 2. Armstrong, his wife Janet, and their son Rick move to Houston alongside other astronaut families. Armstrong befriends Elliot See, another civilian test pilot, and Ed White. As Armstrong begins training, Deke Slayton impresses upon the new astronauts the importance of the Gemini program, as the Soviet Union had reached every milestone in the Space Race ahead of the United States. Armstrong and Janet have a second son, Mark. By 1965, the family has settled in Houston, and Armstrong awaits selection for a crew. After the Soviets complete the first extravehicular activity (EVA), Armstrong is informed that he will be the commander of Gemini 8, with David Scott as the pilot. Prior to the mission, See and Charles Bassett are killed in a T-38 crash, deepening Armstrong's grief at the string of recent losses. Armstrong and Scott successfully launch on Gemini 8, and dock with the Agena target vehicle, but soon afterward, the spacecraft begins to roll at a rapid rate. After nearly blacking out, Armstrong activates the RCS thrusters and safely aborts the mission. Armstrong initially faces criticism, but NASA determines the crew is not at fault. Later, White reveals that he has been selected for the Apollo 1 mission along with Gus Grissom and Roger Chaffee. During a launch rehearsal test on January 27, 1967, a fire kills White and the Apollo 1 crew, and Armstrong hears the news while representing NASA at the White House. The next year, after ejecting from the Lunar Landing Research Vehicle in an accident that could have killed him, Armstrong is selected to command Apollo 11, and Slayton informs him that it will likely be the first lunar landing. As the mission nears, Neil becomes more and more preoccupied and emotionally distant from his family. Just prior to the launch, Janet confronts Armstrong about the possibility that he won't survive the flight, and insists that he should explain the risks of the mission to their young sons. After telling them about the risks he faces, Armstrong says goodbye to his family and departs. Apollo 11 successfully launches and arrives at the Moon four days later. Armstrong and Aldrin undock in the Lunar Module and begin the landing attempt. They realize that they are coming in too fast and are going to overshoot their designated landing site. The new landing site turns out to have much rougher terrain, forcing Armstrong to take manual control of the spacecraft. He lands the lunar module successfully with minimal fuel remaining. After setting foot on the Moon, Armstrong drops Karen's bracelet into Little West crater. With their mission complete, the astronauts return home and are placed in quarantine, where the film of John F. Kennedy's 1962 speech "We choose to go to the Moon" is shown, and Armstrong and Janet share a moment of tenderness. Ryan Gosling as Neil Armstrong, the astronaut who became the first man to walk on the Moon during Apollo 11. Claire Foy as Janet Shearon Armstrong, Neil's first wife. Jason Clarke as Ed White, Neil's friend and neighbor, the first American to walk in space, who died during a pre-launch test for Apollo 1, which was to be the first manned Apollo mission. Kyle Chandler as Deke Slayton, one of the original Mercury Seven astronauts, who became NASA's first Chief of the Astronaut Office. Corey Stoll as Buzz Aldrin, the second man to walk on the Moon during Apollo 11. Gavin Warren as Rick Armstrong, son of Neil Armstrong and brother of Mark Armstrong. Pablo Schreiber as Jim Lovell, Gemini astronaut and backup commander on Armstrong's Apollo 11 mission. Christopher Abbott as David Scott, who flew with Armstrong on the Gemini 8 mission. Patrick Fugit as Elliot See, a member of NASA Astronaut Group 2. Armstrong and See were the backup crew for Gemini 5, and both were later chosen for command assignments: Armstrong on Gemini 8, and See on Gemini 9. See was killed in 1966 when his NASA trainer jet crashed into the McDonnell Space Center in St. Louis, where he was training for that mission. Lukas Haas as Michael Collins, the Command Module Pilot for Apollo 11, who also flew on Gemini 10. Shea Whigham as Gus Grissom, one of the original Mercury Seven astronauts. He was killed during a pre-launch test for Apollo 1, which was to be the first manned Apollo mission. Brian d'Arcy James as Joseph A. Walker, Armstrong's fellow X-15 test pilot who became the seventh man in space by taking that plane into space twice. Cory Michael Smith as Roger B. Chaffee, capsule communicator for the Gemini 3 and Gemini 4 missions, and the third crew member who was killed with Grissom and White in the Apollo 1 pre-launch test. J. D. Evermore as Christopher C. Kraft Jr., NASA's first Flight Director, who was in charge of America's first manned spaceflight and first manned orbital flight, as well as the Gemini 4 mission. John David Whalen as John Glenn, one of the original Mercury Seven astronauts. He became the first American to orbit the Earth. Ethan Embry as Pete Conrad, Pilot of Gemini 5 and backup commander for Gemini 8. Skyler Bible as Richard F. Gordon Jr., the backup pilot for Gemini 8 and pilot of Gemini 11. Ben Owen as John Hodge, the NASA Flight Director in charge of Gemini 8. Olivia Hamilton as Patricia White, Ed's wife. Kris Swanberg as Marilyn See, Elliot's wife. Ciarán Hinds as Robert R. Gilruth, the first director of NASA's Manned Spacecraft Center. Shawn Eric Jones as Wally Schirra, one of the original Mercury Seven astronauts and the ninth person to travel to space. William Gregory Lee as Gordon Cooper, one of the original Mercury Seven astronauts, who piloted the longest and final Mercury spaceflight. He was commander of Gemini 5. Steve Coulter as Günter Wendt, the launch pad leader who was in charge of the spacecraft close-out crews, at the launch pads for the Mercury and Gemini programs, and all manned Apollo missions. Leon Bridges as Gil Scott-Heron, a singer and poet. In early 2003, actor-director Clint Eastwood and production people at the studio Warner Bros. bought the film rights to James R. Hansen's First Man: The Life of Neil A. Armstrong. Eastwood had previously directed as well as starred in the 2000 space-themed picture Space Cowboys, though he stated that he would likely not appear on camera in First Man. Universal and DreamWorks ultimately took up the First Man project in the mid-2010s. Damien Chazelle, who had received critical acclaim for his work on 2014's Whiplash, signed onto the film's production that year, and hired Josh Singer to rewrite an existing script. Gosling, who starred in Chazelle's 2016 film La La Land, joined as well to portray Armstrong in November 2015, and Hansen was hired to co-produce the film because of his role as the book's author. Wyck Godfrey and Marty Bowen also produced the film through Temple Hill Entertainment, with pre-production starting in March 2017. Actor Jon Bernthal was originally attached to the project and was cast as David Scott, but had to depart the project’s production when his daughter suffered a serious illness. PIX Systems were used to aid in the production of this film. Principal photography began in Atlanta in November 2017. Chazelle and cinematographer Linus Sandgren chose to shoot the film in three different formats: 16mm, 35mm and IMAX 70mm film for the Moon sequence. The 16mm format was used in most of the scenes that occur inside the spacecraft, with 35mm film being used for the scenes that take place in the Armstrong house and around the NASA facility. First Man was shot without the use of green screen. Instead, LED displays of up to 10 meters were used. These projected images that would simulate the exterior of the spacecraft, both the earth and space. Next to the screens, several simulators were built, each corresponding to a spacecraft. These were programmed to move synchronized with the images of the spherical LED screens that could be seen through the windows. Chazelle chose this technique because it allowed the actors to get more into the role; instead of seeing a green screen, they saw the outside environment recreated with visual effects. Miniatures were used for several exterior shots of the spacecraft. To recreate Armstrong's home, the production crew built a replica of it in an empty lot. The lunar surface was recreated by building a set on the Vulcan quarry in Atlanta. For the simulation of low gravity on the lunar surface, a balancing system calibrated for the actors was constructed. A single light source was used to simulate the light coming from the Sun. NASA historian Christian Gelzer, as well as astronauts Al Bean and Al Worden, were on set as technical consultants. Paul Lambert served as the main visual effects supervisor. Visual effects for the film were provided by DNEG. To create the images that would be displayed on the LED screens, Terragen, a scenery generation program, was used. Additionally, archival footage such as that of an Apollo launch was used, found by DNEG in a 70mm military stock that had not been seen before. These shots were then cleaned up and extended on each side of the frame. Chazelle believed that it was important that the space scenes in the film matched what people knew from the historical footage, and using the historical footage itself made this possible. The musical score for First Man was composed by Justin Hurwitz. The score was performed by a 94-piece orchestra, with instruments such as the electronic theremin and Moog synthesizer, as well as vintage sound-altering machines including Leslie speakers and an Echoplex. Based primarily on the script from Josh Singer, Hurwitz began creating piano demos before principal photography began until he and Chazelle decided on one that would become the main theme. "It had to have a sense of loneliness but also beauty," said Hurwitz. "Like when he gets to the moon – you're on this barren surface; it's all very beautiful, but it's very, very lonely." Chazelle liked the theremin's association with low-budget sci-fi pictures of the '50s and early '60s because Armstrong and his NASA colleagues were, in their race to the Moon, "basically doing real-life science fiction," Chazelle said. "Those were the sounds and images we had in our minds of the moon, and space in general." "At its heart," said Chazelle, "this was a story about grief, about someone who lost a lot of people he loved, and what those losses did to him. There was something about the theremin that seemed to convey that grief that spanned across the cosmos. It obviously makes you think of space, but it also has those qualities of the human voice – a sort of wailing – that could feel very mournful to me." Hurwitz acquired a theremin and learned how to play it, and his performances are in the final score. "We wanted it to sound electronic but not harsh or abrasive," he said. "I've tried to make it, in most places, pretty mild, and to blend with the orchestra." The score was praised by critics, especially for its balance of softer melodic passages and powerful themes. The digital album was released through Back Lot Music on October 12, 2018. The film had its world premiere at the Venice Film Festival on August 29, 2018. It screened at the Telluride Film Festival on August 31, 2018, and at the Toronto International Film Festival on September 9, 2018. It was theatrically released in the United States on October 12, 2018, by Universal Pictures. First Man grossed $44.9 million in the United States and Canada, and $60.7 million in other territories, for a total worldwide gross of $105.6 million, against a production budget of $59 million. 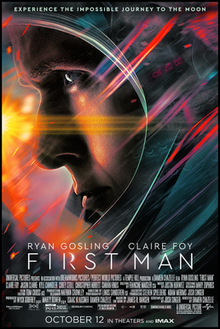 In the United States and Canada, First Man was released alongside Goosebumps 2: Haunted Halloween and Bad Times at the El Royale, and was projected to gross $18–25 million from 3,640 theaters in its opening weekend. The film made $5.8 million on its first day, including $1.1 million from Thursday night previews at 2,850 theaters. It went on to debut to $16 million, finishing third at the box office behind holdovers Venom and A Star Is Born. Anthony D'Alessandro of Deadline Hollywood stated that the under-performance was less a matter of any controversy involving the American flag and more to do with the 141 minute runtime and the film's focus on drama, although Forbes speculated the backlash played a factor. Michael Cieply, also of Deadline, acknowledged that the flag controversy drew Internet criticism and that it could have hurt the film's performance at the box office. The film fell 47% in its second weekend, grossing $8.6 million and finishing fifth, and then made $4.9 million in its third week, finishing seventh. On review aggregator Rotten Tomatoes, the film holds an approval rating of 87% based on 394 reviews, with an average rating of 8.05/10. The website's critical consensus reads, "First Man uses a personal focus to fuel a look back at a pivotal moment in human history – and takes audiences on a soaring dramatic journey along the way." On Metacritic, the film has a weighted average score of 84 out of 100, based on 56 critics, indicating "universal acclaim". Audiences polled by CinemaScore gave the film an average grade of "B+" on an A+ to F scale, while PostTrak reported filmgoers gave it a 79% positive score. Owen Gleiberman of Variety called the film "so revelatory in its realism, so gritty in its physicality, that it becomes a drama of thrillingly hellbent danger and obsession." Writing for IndieWire, Michael Nordine awarded the film a B+, describing it as "A powerful experience that will inspire renewed awe of what Armstrong and his ilk did." Nordine praised the opening flight sequence, Gosling's performance and Chazelle's direction. Peter Howell of the Toronto Star praised the Moon landing sequence, writing: "When the Eagle finally lands on the moon in First Man, the picture truly soars." Nicholas Barber of the BBC gave it a five-star rating, stating that "Gosling and Foy's performances in First Man are probably too unshowy to win awards. But they should, because they could hardly have been bettered. The same goes for the whole of this extraordinary film." A. O. Scott, of The New York Times, wrote that the film "gets almost everything right, but it's also strangely underwhelming. It reminds you of an extraordinary feat and acquaints you with an interesting, enigmatic man. But there is a further leap beyond technical accomplishment – into meaning, history, metaphysics or the wilder zones of the imagination – that the film is too careful, too earthbound, to attempt." Anthony Lane of The New Yorker said the film "captures the grandeur and otherness of the Apollo saga, but not the Midwestern modesty of its hero, Neil Armstrong," writing: "Skillful and compelling this film may be, but, if Neil Armstrong had been the sort of fellow who was likely to cry on the moon, he wouldn't have been the first man chosen to go there. He would have been the last." Richard Brody, also of The New Yorker, said First Man would appeal to right-wing proponents as "a film of deluded, cultish longing for an earlier era of American life, one defined not by conservative politics but, rather, by a narrow and regressive emotional perspective that shapes and distorts the substance of the film." Armond White of the National Review gave the film a negative review, writing: "...director Damien Chazelle aims to give a realistic, procedural account of Armstrong's journey, yet the poetry never happens. Chazelle's take is dour, deliberately unromantic." First Man received ten nominations at the 24th Critics' Choice Awards, where it won for Best Editing and Best Score. At the 76th Golden Globe Awards, where Claire Foy had been nominated for Best Supporting Actress, Hurwitz again won the award for Best Original Score, The film was nominated for seven categories at the 72nd British Academy Film Awards, but did not win any. At the 91st Academy Awards, the film was nominated in four categories including Best Sound Mixing, Best Sound Editing and Best Production Design, with the film's visual effects team of Paul Lambert, Ian Hunter, Tristan Myles and J. D. Schwalm winning the award for Best Visual Effects. On August 31, 2018, it was reported that the film would not include a scene of Armstrong and Aldrin planting the American flag on the Moon. Florida Senator Marco Rubio described the omission as "total lunacy". Chazelle responded with a statement, saying: "I show the American flag standing on the lunar surface, but the flag being physically planted into the surface is one of several moments [...] that I chose not to focus upon. To address the question of whether this was a political statement, the answer is no. My goal with this movie was to share with audiences the unseen, unknown aspects of America's mission to the Moon." United States President Donald Trump commented on the film, "It's almost like they're embarrassed at the achievement coming from America, I think it's a terrible thing. When you think of Neil Armstrong and when you think of the landing on the moon, you think about the American flag. For that reason, I wouldn't even want to watch the movie." Following the film's below-expectations opening of $16 million, some analysts speculated that the flag controversy was in part to blame, while others dispute that presumption. The film revived international interest in Armstrong's first wife, Janet, who plays a central part in the film. She died a few months before the film's release. The Right Stuff, a 1983 docudrama film about the U.S. side of the Cold War Space Race. Apollo 13, a 1995 docudrama film about the 1970 Apollo 13 disaster. From the Earth to the Moon, a 1998 docudrama mini-series based on the Apollo missions. Gagarin: First in Space, a 2013 docudrama film about the first human spaceflight, undertaken by Yuri Gagarin. Spacewalk, a 2017 docudrama film about Alexei Leonov's historic first spacewalk in 1965. ^ a b c d e f "Film Releases...Print Results". Variety Insight. Variety Media. Archived from the original on September 29, 2018. Retrieved July 12, 2018. ^ a b c d D'Alessandro, Anthony (October 14, 2018). "'Sony Swings Past $1 Billion As 'Venom' Bites $35M+; 'First Man' Lands Third With $16M+ – Sunday AM". Deadline Hollywood. Penske Business Media. Archived from the original on October 13, 2018. Retrieved October 14, 2018. ^ Pamela McClintock (November 10, 2018). "Box-Office Preview: 'First Man' to Blast Off in Wake of Juggernauts 'Venom,' 'A Star Is Born'". The Hollywood Reporter. Retrieved March 3, 2019. ^ a b Rubin, Rebecca (September 20, 2018). "Box Office: 'First Man' to Blast Off With $20 Million-Plus Debut". Variety. Retrieved March 3, 2019. ^ a b c "First Man (2018)". Box Office Mojo. Amazon. Archived from the original on June 12, 2018. Retrieved April 14, 2019. ^ "First Man". Universal Pictures. Archived from the original on September 7, 2018. Retrieved September 9, 2018. ^ N'Duka, Amanda (October 9, 2017). "Patrick Fugit Joins Damien Chazelle's 'First Man'; 'The Hate U Give' Casts Dominique Fishback". Deadline Hollywood. Archived from the original on October 20, 2017. Retrieved October 27, 2017. ^ Douglas, Edward (September 29, 2017). ""Spotlight" Star Brian d'Arcy James Lands on Damien Chazelle's Moon Movie "First Man"". The Tracking Board. Archived from the original on November 28, 2017. Retrieved October 27, 2017. ^ D'Alessandro, Anthony (October 17, 2017). "'Gotham's Cory Michael Smith Joins 'First Man's Space Crew". Deadline Hollywood. Archived from the original on October 20, 2017. Retrieved October 27, 2017. ^ N'Duka, Amanda (October 27, 2017). "Skyler Bible Joins 'First Man'; Freddie Stroma Cast In 'Second Act'; Jonathan Goldsmith Boards 'Mamma Mia' Sequel". Deadline Hollywood. Archived from the original on October 29, 2017. Retrieved October 27, 2017. ^ "Why 'First Man' prominently features Gil Scott-Heron's spoken-word poem 'Whitey on the Moon'". Archived from the original on October 17, 2018. Retrieved October 16, 2018. ^ "Eastwood to direct astronaut film biography". Los Angeles Times. March 14, 2003. Retrieved February 19, 2017. ^ Lee, Ashley (March 7, 2017). "Ryan Gosling's Neil Armstrong Biopic Is Set For Fall 2018 Debut" Archived September 1, 2018, at the Wayback Machine. The Hollywood Reporter/Yahoo! Entertainment. Retrieved September 20, 2018. ^ a b Tapley, Kristopher (September 3, 2018). "How Neil Armstrong Biopic 'First Man' Achieved Lift-Off". Variety. Archived from the original on October 12, 2018. Retrieved October 12, 2018. ^ Fleming Jr, Mike (November 24, 2015). "Ryan Gosling Orbiting Damien Chazelle's Neil Armstrong Movie at Universal?". Deadline Hollywood. Archived from the original on October 18, 2017. Retrieved December 29, 2016. ^ Kroll, Justin (December 29, 2016). "Ryan Gosling, Damien Chazelle to Reteam on Neil Armstrong Biopic". Variety. Archived from the original on December 30, 2016. Retrieved December 29, 2016. ^ McClintock, Pamela (April 25, 2018). "Ryan Gosling, Claire Foy Share First Look at Neil Armstrong Biopic 'First Man'". The Hollywood Reporter. Archived from the original on June 12, 2018. Retrieved October 12, 2018. ^ Knight, Molly (December 20, 2018). "Jon Bernthal on What It Means to Man Up". Men's Health. ^ News, MESA (February 27, 2019). "PIX Plays Supporting Role in 91st Academy Award Winning Films (MESA)". Media & Entertainment Services Alliance. Retrieved April 2, 2019. ^ Walljasper, Matt (November 30, 2017). "What's filming in Atlanta now? First Man, Venom, Ozark—plus, you can see downtown in the new Avengers trailer". Atlanta. Archived from the original on March 15, 2018. Retrieved November 4, 2018. ^ O'Falt, Chris (November 1, 2018). "'First Man': How Damien Chazelle Used Handheld 16mm Cameras to Cut Through the Neal Armstrong Myth". IndieWire. Archived from the original on November 2, 2018. Retrieved November 2, 2018. ^ a b "How Cinematographer Linus Sandgren Used Format to Change Visual Tone In 'First Man'". No Film School. October 16, 2018. Archived from the original on November 3, 2018. Retrieved November 2, 2018. ^ a b c Desowitz, Bill (October 15, 2018). "Beyond Christopher Nolan: 'First Man' Redefines In-Camera VFX". IndieWire. Archived from the original on November 3, 2018. Retrieved November 2, 2018. ^ Gelzer, Christian (December 18, 2018). "Observations From The Set Of First Man By A NASA Historian". Sloan Science & Film. ^ Failes, Ian (November 6, 2018). "FIRST MAN: An Effects Odyssey". VFXVoice.com. Archived from the original on November 7, 2018. Retrieved November 6, 2018. ^ "'First Man' Gets Space-Age Feel with Unusual Instruments, Retro Sounds". Variety. Archived from the original on October 31, 2018. Retrieved November 1, 2018. ^ "'First Man' Gets Space-Age Feel with Unusual Instruments, Retro Sounds". Variety. Archived from the original on October 31, 2018. Retrieved October 31, 2018. ^ "'First Man': Film Review | Venice 2018". The Hollywood Reporter. Archived from the original on October 28, 2018. Retrieved October 31, 2018. ^ "'First Man' Offers an Emotional Account of Neil Armstrong's Life (Film Review)". Space.com. Archived from the original on November 1, 2018. Retrieved October 31, 2018. ^ Tapley, Kristopher (July 18, 2018). "Damien Chazelle's 'First Man' With Ryan Gosling to Open 75th Venice Film Festival (EXCLUSIVE)". Variety. Penske Business Media. Archived from the original on July 19, 2018. Retrieved July 18, 2018. ^ Anderson, Ariston (July 25, 2018). "Venice to Kick Off Awards Season With New Films From Coen Brothers, Luca Guadagnino and Alfonso Cuaron". The Hollywood Reporter. Prometheus Global Media. Archived from the original on July 25, 2018. Retrieved July 25, 2018. ^ Vivarelli, Nick (July 25, 2018). "Venice Film Festival Lineup: Heavy on Award Hopefuls, Netflix and Star Power". Variety. Penske Business Media. Archived from the original on July 25, 2018. Retrieved July 25, 2018. ^ Tapley, Kristopher (August 30, 2018). "'First Man,' 'Front Runner' and 'Roma' Among 2018 Telluride Film Festival Selections". Variety. Archived from the original on August 30, 2018. Retrieved August 30, 2018. ^ "Telluride Film Festival Program Guide" (PDF). Telluride Film Festival. Retrieved August 30, 2018. ^ Vlessing, Etan (July 24, 2018). "Toronto: Timothee Chalamet Starrer 'Beautiful Boy,' Dan Fogelman's 'Life Itself' Among Festival Lineup". The Hollywood Reporter. Prometheus Global Media. Archived from the original on August 2, 2018. Retrieved July 24, 2018. ^ Lee, Ashley (March 7, 2017). "Universal Sets Ryan Gosling's Neil Armstrong Biopic for Fall 2018 Debut". The Hollywood Reporter. Prometheus Global Media. Archived from the original on March 9, 2017. Retrieved March 9, 2017. ^ Rubin, Rebecca (October 9, 2018). "'First Man' Takes on 'Venom' and 'A Star Is Born' as October Box Office Goes Galactic". Variety. Archived from the original on October 10, 2018. Retrieved October 10, 2018. ^ Pamela McClintock (October 11, 2018). "Box-Office Preview: 'First Man' to Blast Off in Wake of Juggernauts 'Venom,' 'A Star Is Born'". The Hollywood Reporter. Archived from the original on October 11, 2018. Retrieved October 11, 2018. ^ a b Amos, Jim (October 14, 2018). "Houston, Ryan Gosling And 'First Man' Have A Problem". Forbes. Archived from the original on October 15, 2018. Retrieved October 15, 2018. ^ a b Cieply, Michael (October 14, 2018). "What Do Words Cost? For 'First Man,' Perhaps, Quite A Lot". Deadline Hollywood. Archived from the original on October 14, 2018. Retrieved October 15, 2018. ^ D'Alessandro, Anthony (October 21, 2018). "'Halloween' Scares Up Second-Best October Opening With $77M+; Best Debut For Blumhouse & Carpenter Canon; Great Launch For Miramax". Deadline Hollywood. Archived from the original on October 20, 2018. Retrieved October 21, 2018. ^ D'Alessandro, Anthony (October 28, 2018). "'Halloween' Screams $32M Second Weekend As October B.O. Moves Toward Record". Deadline Hollywood. Archived from the original on October 27, 2018. Retrieved October 28, 2018. ^ "First Man (2018)". Rotten Tomatoes. Fandango Media. Retrieved December 9, 2018. ^ "First Man Reviews". Metacritic. CBS Interactive. Retrieved November 29, 2018. ^ Gleiberman, Owen (August 29, 2018). "Venice Film Review: Ryan Gosling in First Man". Variety. Archived from the original on August 29, 2018. Retrieved August 30, 2018. ^ Nordine, Michael (August 29, 2018). "First Man Review: Damien Chazelle and Ryan Gosling's Thrilling Neil Armstrong Biopic Has the Right Stuff – Venice". IndieWire. Penske Business Media. Archived from the original on August 30, 2018. Retrieved August 30, 2018. ^ "Ryan Gosling's First Man is a space hero with soul". Archived from the original on October 15, 2018. Retrieved October 15, 2018. ^ Barber, Nicholas (August 29, 2018). "Film review: Five stars for First Man". BBC Culture. BBC. Archived from the original on September 2, 2018. Retrieved September 3, 2018. ^ Scott, A. O. (October 10, 2018). "Review: Review: 'First Man' Takes a Giant Leap for Man, a Smaller Step for Movies". The New York Times. A.G. Sulzberger. Archived from the original on October 13, 2018. Retrieved October 13, 2018. ^ Lane, Anthony (October 8, 2018). "Damien Chazelle's Moon Shot in "First Man"". The New Yorker. Condé Nast. Archived from the original on October 14, 2018. Retrieved October 13, 2018. ^ Brody, Rochard (October 10, 2018). ""First Man," Reviewed: Damien Chazelle's Neil Armstrong Bio-Pic Is an Accidental Right-Wing Fetish Object". The New Yorker. Condé Nast. Archived from the original on October 10, 2018. Retrieved November 11, 2018. ^ White, Armond (October 12, 2018). "American Exceptionalism – Not! First Man Falters". National Review. Archived from the original on November 2, 2018. Retrieved October 31, 2018. ^ Nordyke, Kimberly (December 10, 2018). "Critics' Choice Awards: 'The Favourite' Leads With 14 Nominations". The Hollywood Reporter. Retrieved February 17, 2018. ^ Crist, Allison (January 13, 2019). "Critics' Choice Awards: 'Roma,' 'Americans,' 'Mrs. Maisel' Top Winners". The Hollywood Reporter. Retrieved February 17, 2019. ^ Staff (December 6, 2018). "'Vice,' 'The Assassination of Gianni Versace' lead 2019 Golden Globe nominations". Los Angeles Times. Archived from the original on December 6, 2018. Retrieved February 17, 2018. ^ "All the Winners of the 76th Golden Globes". Hollywood Foreign Press Association. January 6, 2019. Archived from the original on January 8, 2019. Retrieved February 17, 2019. ^ "91st Oscars® Nomination Announced" (Press release). Los Angeles, CA: Academy of Motion Picture Arts and Sciences. January 22, 2019. Archived from the original on January 23, 2019. Retrieved February 17, 2019. ^ Hipes, Patrick (August 31, 2018). "'First Man' Director Damien Chazelle & Neil Armstrong's Family On Flag Flap: It's Not A Political Statement". Deadline Hollywood. Archived from the original on September 2, 2018. Retrieved September 3, 2018. ^ Rose, Steve (September 6, 2018). "'If anyone can Maga, it is Nasa': how First Man's flag 'snub' made space political again". The Guardian. Steve Rose. Archived from the original on September 6, 2018. Retrieved September 6, 2018. ^ McAlone, Nathan (October 23, 2018). "The American flag controversy around 'First Man' isn't the reason it's struggling at the box office". Insider. Retrieved November 4, 2018. ^ "Five things you didn't know about Janet Armstrong". Woman's Day. Australia. October 8, 2018. Archived from the original on October 31, 2018. Retrieved October 31, 2018 – via Pressreader.com. ^ McNally, Siobhan (October 12, 2018). "True story behind First Man: Neil Armstrong's wife Janet was often a 'single mother' to their children while he pursued his dream". Daily Mirror. UK. Archived from the original on October 31, 2018. Retrieved October 31, 2018. ^ Friedman, Chloé (October 16, 2018). "Janet Elizabeth Shearon, l'inébranlable épouse de Neil Armstrong". Le Figaro (in French). Archived from the original on October 31, 2018. Retrieved October 31, 2018. ^ "Janet Shearon Armstrong 1934 - 2018". Houston Chronicle. June 27, 2018. Archived from the original on October 31, 2018. Retrieved October 31, 2018 – via Legacy.com. Wikimedia Commons has media related to First Man.